The results of the annual Speexx Exchange Survey show that even in mature multinationals, there is still a considerable gap between L&D and corporate goals. Rather than building an attractive learning culture that will help the organization achieve its goals, L&D is still taking a reactive role. Download this white paper and learn how to correctly manage your HR and L&D strategy in order to maximize the value of your cloud-based learning solutions and underpin your organization’s strategic objectives. L&D alignment with corporate goals – what is the reality? 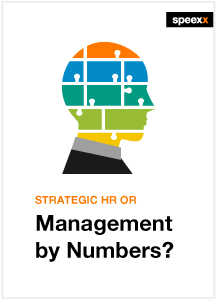 What is the number one challenge for HR and L&D? What are the correct numbers and KPIs when managing L&D? How can you address resourcing and retention more effectively? Take your L&D strategy to the next level – 5 steps to success.